We love a great hack! And you can make your photography shine with some simple hacks that can help you nail the perfect shot. Whether it’s camera shake, emergency lighting or tips on how to create an instant wind machine, this episode is a treasure trove of tips from Gina, Valerie and the photography community. 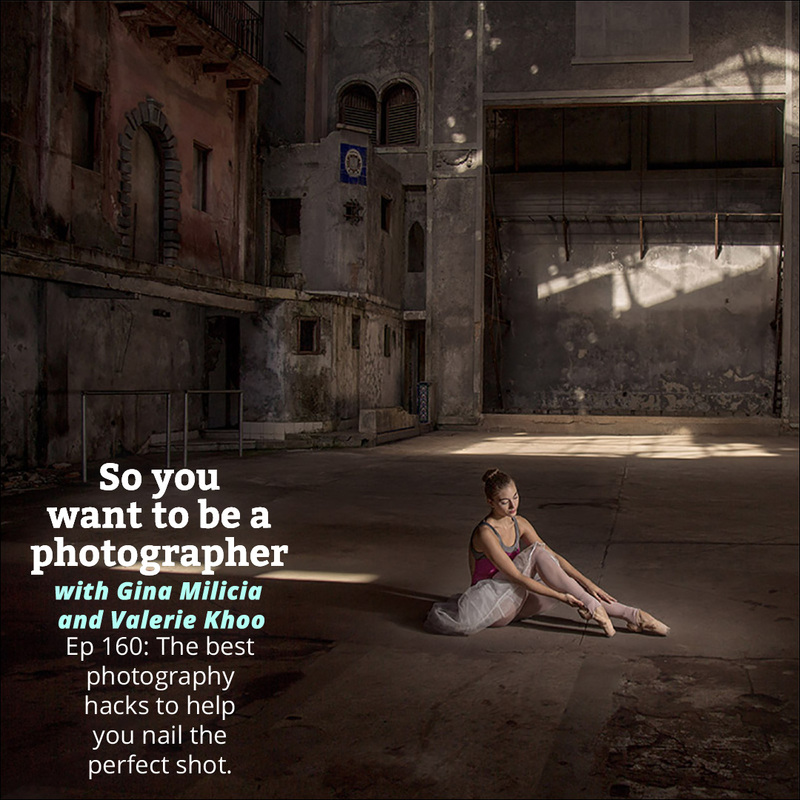 Gina and Valerie reveal cool hacks that can make all the difference in your photography. Phil Enn: Shooting into the sun I always have autofocus issues. I just hold my hand out hiding the sun from the lens and it auto focuses no worries. Keep the shutter down, whip your hand out of frame and take the shot. Light and flare a-plenty and a well focused shot. Peter Foote: When I’m herding cats at a wedding, I find the nearest school teacher. They have a tone that makes everyone revert back to 11 years old and do as they are told! Use a blue, brown, black or green marble to find great catchlights. Sam Webster: I shone my iPhone torch through a serviette at dinner last night for a travel blogger. Was an amazing softbox for her bowl of gelato. Thor Dut: As a speed light modifier i used a translucent plastic milk bottle. I always have one of those plastic shower caps that you get at a hotel for free, it is a perfect rain cover for the camera. I used silicagel packs to keep the moisture away from the camera bag when i went in the jungle, you always find those packs in the box of the new shoes. To get a dreamy effect i shoot through cotton or something fluffy like that. Keith Macke: If you take photos in your home replace all the lightbulbs with daylight balanced ones. So much easier to post process. Allan Malenfant: When its difficult to get a clean exposure reading due to subject distance etc I take a reading from the palm of my hand. Eva Solymosy: Use a (small make up) mirror for some not so obvious extra reflection, like in an area normally in the shadow part of the shoot or just as additional light. This is not meant for head shoots, obviously, more for smaller objects. Shua Smith: Absolutely need to use a pop up flash for fill? Use a napkin to diffuse it. Don’t have gels? Colored craft cellophane with rubber bands works well.